"Sampath Speaking" - the thoughts of an Insurer from Thiruvallikkeni: language problem ... not humans this time !!! There are thousands of languages – Our Nation has hundreds of languages with Hindi in Devanagari script being the principal official language. Indian languages belong to several linguistic families – Dravidian being an important one. The Dravidian family includes 85 languages approx and is spoken by millions of people, predominantly in Southern India and parts of Sri Lanka and some other countries. Tamil, Telegu, Malayalam, Kannada are the prominent ones. The antiquity of the language is studied through epigraphs which is study of inscriptions on stones and on others forms dating back to centuries. .. .. .. and there can be language problem in not understanding !! Most references to it are derogatory – the animals are often remarked to be slow and non-caring;’ non-responsive whether it hot Sun or raining heavily – they also say ‘it does not wander from the marsh where it was born’ … in Olden days, when students were faring poorly, the parents would derisively say ‘fit only for rearing them’ !! – The color is jet black. Rarely white markings on face and leg extremities may be there, but are not preferred. It has short, characteristic tightly curled horns, turning backward and upward and finally spirally curving inward. Eyes are black, active and prominent in females; Udders are fully developed, drooping with equally distributed teats over the udder. Teats are long, and places uniformly wide apart but hind teats are longer than fore teats. 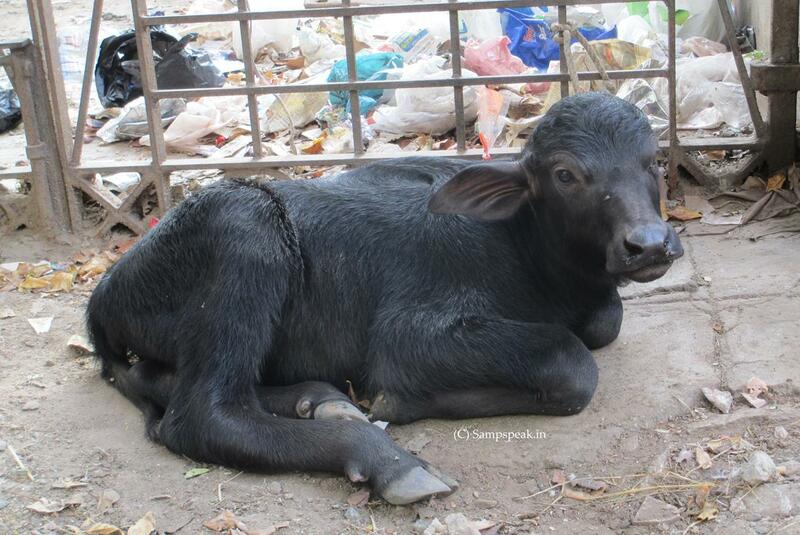 .. … in Triplicane, as you come out early morning, you are sure to find cattle ~ cows and buffaloes roaming on the street. The buffaloes are considered lazy and carefree animals…….they occupy the centre of the road and do not care to move … the buffalo that we see on road is commonly known as ‘water buffalo’ - (Bubalusbubalis) suitable for tilling rice fields, and their milk is richer in fat and protein than of the dairy cow. A few days back - Telangana Chief Minister said the government will soon launch a comprehensive scheme for the development of dairy sector in the state to bring in a ‘KsheeraViplavam’ (Milk Revolution). The chief minister announced that the government through dairy development societies would provide 50 per cent subsidy for buying a buffalo by the farmer and the subsidy would be 75 per cent if the dairy farmers happen to be from the SC/ST community. In return, the CM has asked for a favour that every farmer in his household should plant six saplings and name each sapling after one of their family members and take care of the plants by watering it regularly, said a release. The neighbouring Andhra Pradesh too has similar plans of supporting and increasing teh cattle population. The state government introduced rules to purchase buffaloes from other states for increasing the number of buffaloes in the state under government aid scheme. .. .. but this has created a rather piquant situation ~ the language problem. Following the decision, a number of beneficiaries brought buffaloes from Haryana and Tamil Nadu. But most of these imported buffaloes were not giving milk, said Pithapuram MLA S V S N Varma Raising the topic in the AP Assembly. The MLA said that beneficiaries were ready to corner the MLAs if the government does not change the rules for purchasing buffaloes within the state. The MLA also made interesting comments raising the topic during the Question Hour. Much to the amusement of the House, he said that the buffaloes which are being imported from Tamil Nadu and Haryana do not understand the language of Telugu people and are not giving milk. The buffaloes are being transported from other states on trucks packed like sardines, he said, and added that was also one of the reasons for their falling sick, if not injured. Women generate income from dairy products, he said, and added that the rules framed by the state government turned a big problem to them. He requested the government to make necessary changes facilitating purchase of buffaloes from the 13 districts of Andhra Pradesh. Labour minister Atchannaidu said that the rules were framed to improve the strength of buffaloes in the state. However, he assured them that the government would pursue the issue. In another interesting news, nearly 2.5 lakh cattle, out of around 90 lakh in Madhya Pradesh, have been stamped with unique identities, similar to the 12-digit Aadhaar number, to enhance their safety as well as increase milk production, officials said. The ears of these bovines are being tagged with UID numbers as part of an ambitious scheme of the National Dairy Development Board (NDDB). An official said that cows and buffaloes are being tagged in this manner to create a nationwide recording mechanism called the Information Network for Animal Productivity and Health (INAPH). The plan, it is stated, was to complete the tagging of all the 90 lakh cattle in MP in the second phase. "A cattle dossier, comprising the animal's age, breed and other characteristics, will be created which would be uploaded onto the INAPH's Information Technology Application so that each cow or buffalo's unique identity is available on gadgets," the official explained. The cattle UID would then be linked to the Aadhaar number of its owner which in turn would check the illegal sale and purchase, smuggling and abandoning of cattle, he added.